It’s 1969, the year human-operated telephone networks are coming to an end across the UK. Susan (Emily Webster) is a phone-operator; it’s been her job since before the war, and by her own admission is perhaps her only skill. When her eavesdropping makes her aware of the imminent advent of automated switchboards, she decides to try to stem the tide of technological progress that threatens her and her colleagues’ jobs. "this is a play that emphasises voices, playing with overlapping conversations to draw us into Susan’s world"
Sixties music and several corded phones set the scene. The ADC Theatre’s Larkum Studio is a small space where the separation between performers and spectators is practically impossible to maintain. The production rightfully leans into this by placing some of the telephones both among and behind the audience. Actors dart in and out, forming a confusing criss-cross of conversations over the shrill ringing of the phones. Although it was sometimes hard to follow what was happening, especially in the opening scene, juxtaposing the rapid-fire requests from callers with Susan’s steady and efficient responses successfully establishes her as the crux of a vast network. Adding to the confusion though was the fact that I often found myself struggling to see the actors as they spoke, either because they were behind me or, as was often the case for Susan, seated at a desk and thus obstructed from view. It was frustrating to only be able to catch glimpses of our protagonist’s reactions to the conversations she listens in on. 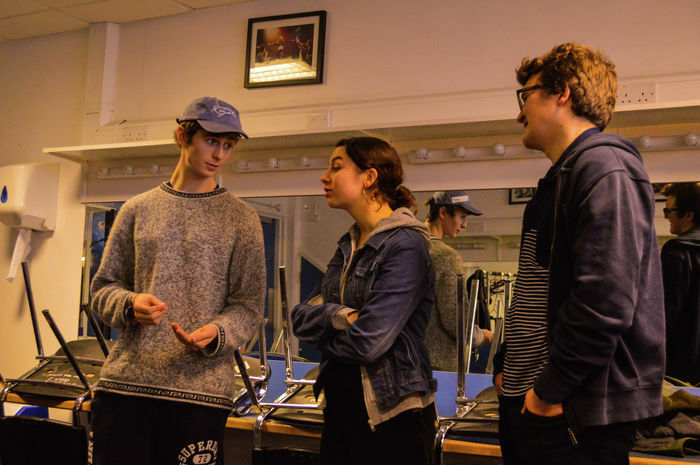 Still, this is a play that emphasises voices, playing with overlapping conversations to draw us into Susan’s world, so having the actors’ voices firing from all directions around us was very effective in creating a sense of immersion. The actors themselves were solid for the most part, despite a few awkward performances here and there. A true highlight among the supporting cast was Clara Morel, who nailed the voices, facial expressions, and body language of each of her characters. Izzie Collie-Cousins and Rowan Gow begin slightly flat but both manage to come into their own over the course of the play. Collie-Cousins’ Mary offers a fun and energetic counterpart to Susan, while Gow rather unexpectedly plays up the arrogant and uncaring boss character in his final scene, with great results. I think my favourite part of the play was how Writer and Director Will J-Wood uses contrast to make certain moments stand out. From the frenzy of connecting calls, suddenly there is silence. Now it is Susan’s turn to pick up the phone, and begin a monologue to her daily “mystery caller”. As she stands alone, away from the switchboard, with all the lights focused on her, she truly shines. Webster deftly handles the shift from the cheeky, gossip-loving, “I never listen to conversations that don’t concern me” Susan, to one who is vulnerable, lonely, desperately pleading with her silent caller for some kind of answer. These quiet moments reveal a very human side to what could have been a classic and uninspired conflict between past and future. J-Wood refuses to dismiss Susan as being unable to keep up with the times. Instead, he centres the harm that unchecked, profit-driven technological upgrades can do to everyday people. It quickly becomes clear how much Susan cares about her colleagues, hundreds of women who are about to be made redundant en masse and are being offered no contingency plan. J-Wood skilfully builds tension by increasing the urgency with which Susan and Mary struggle, even as the audience knows automation is inevitable. Their fate almost has some element of tragedy to it, but ultimately the play’s message is one of optimism and hope. End of the Line is a fun and endearing play that does what it sets out to do. A small-scale production limited by space and a little rough around the edges, it tells a story about human connection, community, and the little (wo)man against the big corporation. Oh, and there’s a heart-warming lesbian love story too. End of the Line is on at the ADC Theatre (Larkum Studio) until Saturday, February 2nd. Tickets are £6-£8.